Frisco Kids: Coming Up: Kings Mountain Art Fair Labor Day Weekend - Free! Coming Up: Kings Mountain Art Fair Labor Day Weekend - Free! 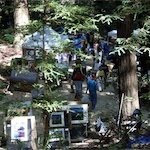 King's Mountain Art Fair, Labor Day Weekend, September 5-7, in Woodside 10:00 a.m. -5:00 pm. Admission and parking are free. Labor Day weekend means one thing to the Kaplans: Kings Mountain Art Fair. We end up hundreds of dollars poorer each year, but it's fun and in a woodsy outdoors setting. 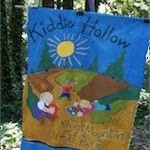 The kids love Kiddie Hollow, with spin art, puppet making and other fun activities run by local high school kids. Tickets run $3 for 12 tickets (I think it’s a few tickets per craft), and they have books you can read the kids while lounging on comfie beanbags too. Just outside Kiddie Hollow, the local school moms sell enormous home-baked cookies for $3 as a fundraiser. The fair also features expensive face painting and some booths selling kid-stuff. You can meet the firemen. The quality of the crafts is excellent, and the fair features NO corporate sponsorship. It's a community-run affair, benefitting the fire department and elementary school. The fair runs Saturday to Monday from 10:00-5:00. Go early - parking is tough. The festival is on Skyline Blvd, about 6 miles south of Hwy 92. It’s a twisty narrow road and parking is where you pull onto the shoulder in the dirt. The later you get there, the further you park (though they have shuttles). One idea is to get there in time for the pancake breakfast (8:00 to 10:30) – and then parking is much easier. (They sell lunch too).